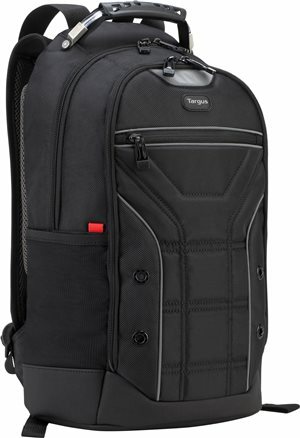 The Targus Drifter Sport Backpack is smart, compact, comfortable and, for a smaller backpack, big on space. Designed for laptops up to 14" and featuring 3 zippered pockets of varying size, the Drifter Sport has an intuitive place for everything. Aside from the padded laptop compartment, there is a water bottle holder, a soft, lined zippered glasses compartment, along with obvious nooks for pens, pencils, and business cards. And when it's loaded full of your stuff, the padded straps and back aeration pads provide a comfortable, well balanced fit. The Targus Drifter Sport Backpack is smart, compact, comfortable and, for a smaller backpack, big on space. Designed for laptops up to 14” and featuring 3 zippered pockets of varying size, the Drifter Sport has an intuitive place for everything. Aside from the padded laptop compartment, there is a water bottle holder, a soft, lined zippered glasses compartment, along with obvious nooks for pens, pencils, and business cards. And when it’s loaded full of your stuff, the padded straps and back aeration pads provide a comfortable, well balanced fit. Designed around protecting and transporting a 14” laptop, the Targus Drifter Sport offers a sensible amount of organized storage. The large compartment features the padded, secured laptop “sleeve”, padded, lined, zippered glasses compartment and additional room for books, notebooks or files. The medium compartment is your “desk drawer” with nooks for pens, pencils, and business cards, with additional room for a couple of paperbacks or lunch. There is also a smaller, flat, zippered pocket for important papers, ID, phone, etc. From the rubber-coated, reinforced cable handle to the heavy duty, water resistant base, the Drifter Sport Backpack is built to last. Featuring durable EZ-glide zippers throughout and reinforced strap guards, the Drifter Sport is truly a product of mindful design, and engineered for overall longevity. Along with durability and organization there are also several elements of protection designed into the Drifter Sport Backpack. Of course there is the padded and secured laptop compartment, but the bottom portion of the backpack has an extra 1/4” of foam to protect against “hard landings.” There is also the soft lined, zippered glasses compartment and one of the aeration pads doubles as a secret, zippered compartment for and wallet, passport or any valuables. When you first pick up a fully packed-out Drifter Sport by the handle, you’ll notice a feel of structural integrity. The steel cable handle is securely riveted to the backpack and encased with a pliable rubber handle, which is further secured with additional nylon supports. When you swing the back pack onto your shoulders, ample shoulder pads cushion the weight. And as the load settles into place, the 4 aeration pads provide cushions for your back.